From the perspective of socio-economic indicators, the inclusion of India in the BRICS bloc of nations is puzzling. In India, income levels are low and poverty rates are high, while poor education and health outcomes have been accompanied by slow improvement (see Table below). Economic inequality has risen in the past 15 years: A Credit Suisse report on distribution of wealth reports that the top 1 per cent in India own 49 per cent of the country’s wealth in 2014 (up from 36 per cent in 2000). The share of the bottom 50 per cent is 4.5 per cent. 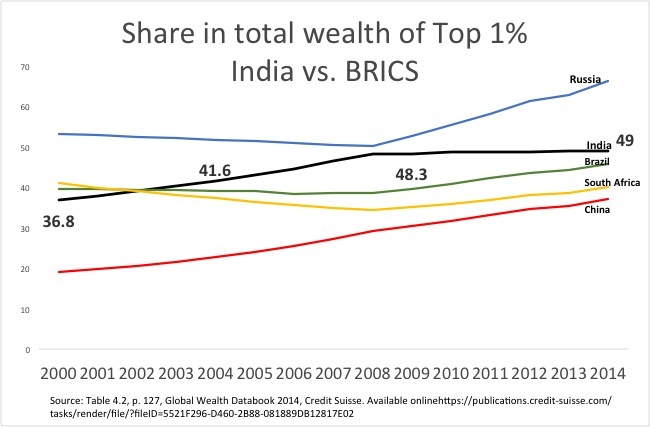 Again, India fares badly compared with other BRICS except Russia (see graph). If one were to bring in social inequalities (based on caste and gender), the picture becomes worse. Female labour force participation rates are low, and women are routinely paid less than men. According to the Indian Human Development Survey, one-third of rural households and one-fifth of urban households self-reported practicing untouchability (a legally abolished caste practice of ostracizing a group through segregation). The numbers are twice as high, 62 per cent and 40 per cent respectively, among Brahmins (who are on top of the caste hierarchy). Meanwhile, tax revenues (as a percentage of GDP) are the lowest in India (10.7 per cent). According to economists, Thomas Piketty and Nancy Qian in their study “Income Inequality and Progressive Income Taxation in China and India” (2009), the share of the Indian population that pays income tax has been stuck at around 2-3 per cent since the 1980s. Meanwhile, the tax base in China increased from under 1 per cent to nearly 20 per cent. 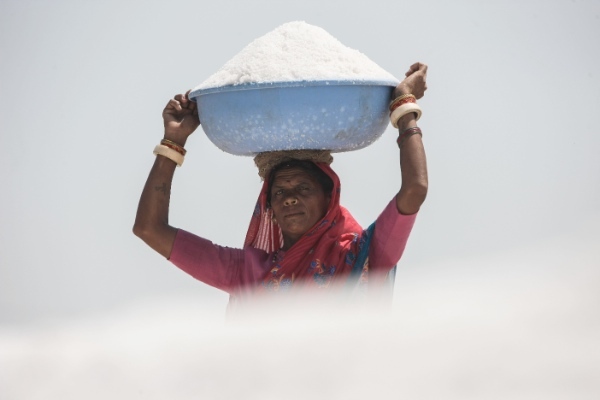 India’s use of its meagre public resources is also a cause for concern. Public services tend to have the first claim on public revenues in other countries (see table). Apart from being lowest among BRICS, India’s health expenditure is lower than military expenditure. Judging by these parameters, India is a misfit among the BRICS. Source: World Development Indicators. Data for the latest year for which available in the 2011-2014 period. Against this backdrop, the efforts of the past decade in India at creating some social security system – though belated, reluctant and inadequate – were commendable. The National Rural Employment Guarantee Act (NREGA) was a step towards recognizing the right to work; the Forest Rights Act initiated a process of freeing communities living on forest lands from harassment from forest officials by granting them land and other rights; and the Right to Information Act sought to increase transparency and accountability of the government. The recognition of these rights through legislation rather than policy (in India and elsewhere) was to delink the creation of a welfare system from the mood of political bosses. Sadly, and shockingly, the newly elected government has immediately attempted to weaken or dilute several of these laws (forest rights, food security act, and labour laws, among others). In the case of the National Rural Employment Guarantee Act (NREGA), for instance, a proposal to restrict it to approximately one-third of all districts was floated. The NREGA is a public works programme guaranteeing 100 days of employment each year to adults of rural households at the minimum wage. Combining manual work with minimum wages ensures that only those who have no other opportunity show up for these works. The NREGA, thus, combines a universal right with self-targeting. In the last financial year, NREGA got 0.3 per cent of GDP and created employment for 25 per cent of the rural population. The research on NREGA suggests that in spite of all the problems in implementation (corruption, flow of funds, etc), it has achieved some success: providing economic security, protecting labour – especially from disadvantaged communities – from exploitative employment, battling corruption, exhibiting potential for asset creation in rural areas, etc. After being criticized sharply for its damaging proposals, the government appears to have shelved them, but the “slow suffocation” of NREGA continues through budget cuts. With great reluctance previous governments accepted the need to do something about India’s unacceptably poor development outcomes. This translated into marginal gains in social spending and imperfect but important legislative protections. 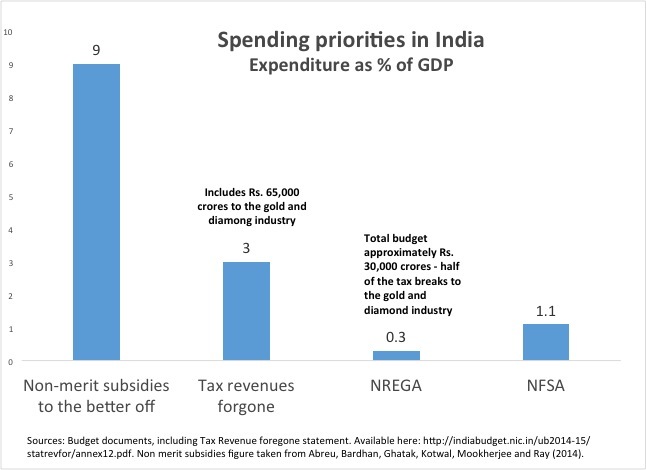 While an OECD study described India’s social protection system as “very fragmented” with “very limited coverage” (p. 82), within India a false impression of it becoming a nanny state that provides generous “doles” for the poor has been created (see figure on spending priorities). With close of half of Indian children being undernourished, one-third being illiterate it is not clear how the ruling class obsessed with “superpower” status hopes to achieve it. The refusal to invest in its main economic “resource” – her own people – will ultimately prove counterproductive for the ruling class as well as ordinary people. The views expressed in this article are the author's own and do not necessarily reflect the publisher's editorial policy. Hope all is well. This is a great article and seems like you work in these subject areas. I keep pondering about the outcome of the increasing gap and what type of social unrest we will experience over time. Please do let me know if there is more of your research work I can read on the Internet. The World Development Indicators table was quite an eye-opener. I did not expect so much of a contrast. Reetika, well written – military expenditure beats healthcare expenses. Reetika Khera, a development economist, teaches at the Indian Institute of Technology Delhi.